We endeavour to ship your order within 2 business days of receipt of your order. The delivery fee is is non-refundable unless the goods fail to comply with the consumer guarantee provisions of the Australian Consumer Law. 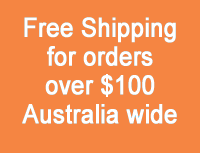 Delivery to your door via Australia Post or courier. Delivery time will vary depending on your location.